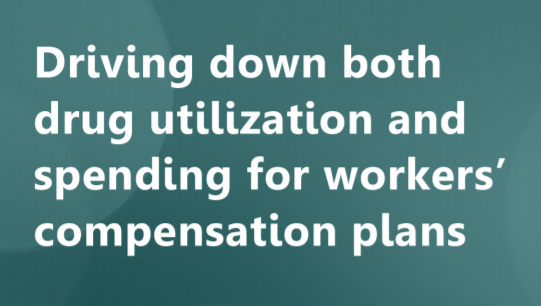 What’s Next for Work Comp Pharmacy? There’s been some good news in the pharmacy department lately, at least for myMatrixx clients. We have practically eliminated the egregiously priced compounds that have plagued our market for so many years, and opioids dropped out of first place in the most commonly dispensed drug category for many of our clients. All 50 states have finally implemented Prescription Drug Monitoring Programs, and many have adopted formularies and/or treatment guidelines. In addition, advances in pharmaceutical science point to a safer drug therapy future. Yet, pharmacy remains a major concern for employers, insurance carriers, third-party administrators, and other payers. They mainly worry about what’s coming next. Will we see an influx of drugs that are even more dangerous than opioids? What about the effect of medications on aging workers? And, what is the potential impact of specialty medications on work comp? Pharmacy costs also keep payers up at night. Are there drug-pricing schemes on the horizon that will increase our clients’ drug spend without delivering improvements in clinical pharmacy care? Are PBMs reducing costs or adding to them as some headlines suggest? myMatrixx will address these and other pressing concerns in our 2018 Drug Trend Report, which combines legacy Express Scripts data with myMatrixx data for an analytical and comprehensive view of work comp pharmacy. The report examines clients’ overall drug spend and opioid usage in 2018. Spoiler alert: our clients have seen a decrease in both. It also delves into the usage of various drug categories and examines emerging medication risks and cost drivers, including specialty drugs. The drug trend report takes a deep dive into the costs associated with various delivery channels, such as mail order, retail pharmacies, and physician dispensed. And it covers the various factors that influence pricing, including some you might not have considered, such as the occupations of the insured. We made some significant changes to the report’s methodology to reflect the changing marketplace. For example, days’ supply is used to measure prescription usage instead of number of scripts. While seemingly subtle, this change enables us to more accurately capture prescribing behavior, since restrictions placed on the quantities of drugs prescribed can artificially inflate the prescription count. In addition, we exclude specialty medications from the overall trend, so the results reflect typical payer costs. However, everyone should pay close attention to the section on specialty drugs, which may cost many multiples of the price of traditional medications. The treatment for a single Hepatitis C case can run $100,000, enough to bankrupt a small self-insured employer. The report also shows the impact of expanding our Get Ahead of The Claim program and philosophy that has steered our clinical strategy for the past decade. We have widened the scope of Get Ahead of the Claim from an opioid-dominated management program to a holistic pharmacovigilance service that also examines other drugs of concern, such as benzodiazepines, sedative hypnotics, amphetamines, and identifies potential fraud and abuse and will potentially help our clients avoid the next pharmacy crisis. Finally, the report, which will be available on our website on April 18, offers meaningful, actionable clinical and cost-containment solutions to the wide array of pharmacy concerns facing today’s workers’ comp payers. The Express Scripts Lab, a pharmacy think tank that provides healthcare insights, drug trend analysis, evidence-based research articles and peer-reviewed publications, worked in tandem with our business intelligence consultative team to create the report. Rochelle Henderson, PhD oversees the lab, supervising a team of PhD health policy researchers and working closely with schools of pharmacy and medical schools to develop high-impact solutions. 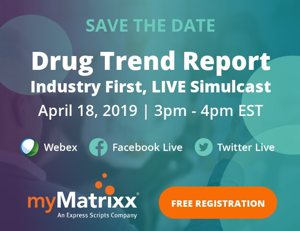 Dr. Henderson will join myMatrixx President Mike Cirillo, Cliff Belliveau, our Vice President of Business Intelligence, and myself to present the findings of the 2018 Drug Trend Report during a live simulcast via webinar, Facebook and Twitter on April 18, starting at 3 p.m. Eastern. See the report highlights in the simulcast and download the free, full report on April 18. This is a sponsored post from WorkCompWire marketing partner myMatrixx.